With more than 60 bands each year Shaky Knees is a rock-lover's dream. Since its inception in 2013, Shaky Knees has featured a diverse lineup ranging from world-renowned acts to up-and-coming artists. This year's lineup includes Beck, Incubus, Cage The Elephant, Tame Impala, Tears For Fears, Tash Sultana, Dashboard Confessional, Gary Clark Jr. Interpol, Jim James, The Struts, Tyler Childers, Foals, Maggie Rogers, Grouplove and many more! 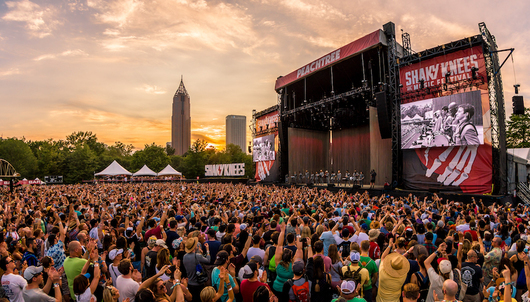 For more information on Shaky Knees, click here. The winning bidder will receive their two (2) 3-day wristbands via FedEx within one (1) week prior to Shaky Knees. Guests will receive one (1) wristband per guest that each attending guest will need to wear the entire 3 days. Wristbands are non-removable and non-transferable. To utilize the full-service cash bar or complimentary beer listed above, guest must be at least 21 years of age. SHAKY KNEES MUSIC FESTIVAL, LLC, C3 PRESENTS, LLC, TIME, INC. AFFLUENT MEDIA GROUP, AND EACH OF THEIR RESPECTIVE PARENTS, SUBSIDIARIES, AND AFFILIATES ARE NOT SPONSORS OF AND ARE IN NO WAY RESPONSIBLE OR LIABLE FOR THIS PROMOTION OR AUCTION INCLUDING WITHOUT LIMITATION, THE ADMINISTRATION OF THE PROMOTION OR AUCTION OR THE VERIFICATION OF WINNING BIDDERS. ALL INQUIRIES REGARDING THIS PROMOTION OR AUCTION SHOULD BE DIRECTED TO THE DELTA AIR LINES, INC. AS STATED IN THE USER AGREEMENT AND NOT TO THE SHAKY KNEES PARTIES. THE SHAKY KNEES PARTIES WILL BE RELEASED, INDEMNIFIED, AND HELD HARMLESS, AND FURTHER MAKE NO REPRESENTATIONS AND/OR WARRANTIES, EITHER EXPRESS OR IMPLIED, IN THE SAME MANNER AS THE DELTA ENTITIES AS STATED IN THE USER AGREEMENT.